Eric has been born in 1898, the eldest of three children of Alice Beatrice (nee Farmer), and William Cox Rose Esq. a dairy farmer of Moat Farm at Ford near Aylesbury, Buckinghamshire. He was educated at Lord Williams’s Grammar School in Thame, where he boarded from 1909 to 1914, and where reportedly, he showed great promise. As soon as he was 18, he enlisted at Aylesbury with the Artists Rifles, the 28th (County of London) Battalion of the London Regiment, on 11th December 1916. 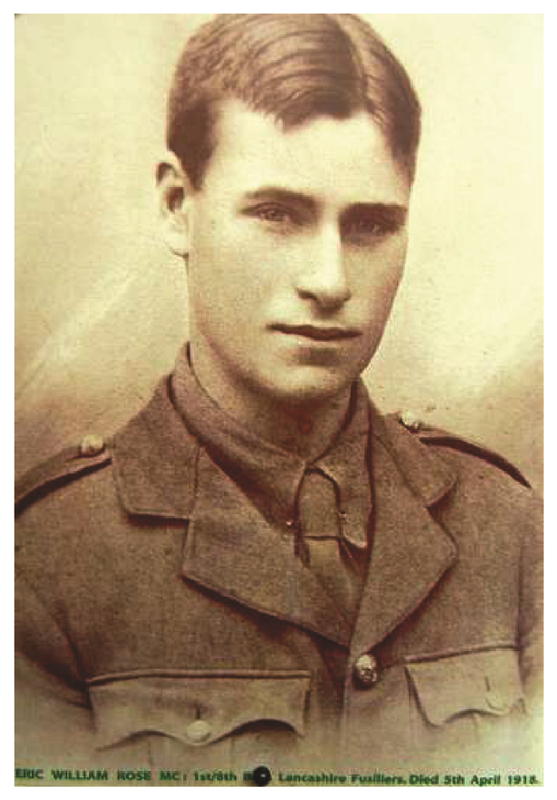 Like many other young men from public schools he was placed in the battalions cadet school for officer training, and was commissioned as a second lieutenant with the Lancashire Fusiliers on the 28th August 1917. Posted to the 1/8th Battalion he joined the battalion in France at the end of October. When the German Army launched their attack through the Somme in March 1918, the 125th Infantry Brigade, of which the 1/8th Lancashire Fusiliers were a part, was moved up to help defend the line. On the 25th March, 11 days before his death, having been captured and then escaped, Eric took over command of C company in a counter-attack after his company commander, Captain R Alderson was killed. This was an action for which Eric was awarded the Military Cross for ‘conspicuous gallantry and devotion to duty’. During the next few days the British Third Army was forced to retreat in front of the German advance. On the 5th April, the final day of the German assault, the 1/8th Lancs. Fusiliers were in trenches near the village of Bucquoy. The day started with a heavy German artillery barrage, followed by fierce fighting, both flanks of the line being forced back. Some confusion surrounds his burial place. Despite official reports that his body was never recovered from the battlefield, Rev T B Hardy VC wrote that he had found Eric’s body in the ruins of Bucquoy and buried him there. The search for his grave continues by his descendant Michael Rose. 2/Lieut. 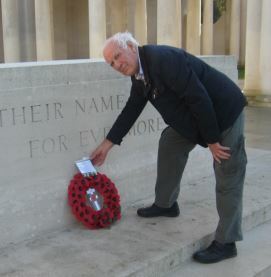 Eric William Rose is commemorated on the Arras Memorial, and remembered on the Lord William’s School Honours Board and on the War Memorial in Ford. He is also remembered on the Artists Rifles War Memorial in the entrance portico of the Royal Academy in London.